What Does Bruxism Mean for Your Health? You may not be familiar with the term “bruxism,” but you’ve definitely heard of this condition. Bruxism is an unconscious grinding of the teeth. This condition affects patients while they sleep, and can cause premature wear of the teeth. However, that’s not the only negative that comes with teeth grinding. You may experience a number of health problems if you suffer from bruxism. What makes the condition so difficult to deal with is the fact that you may not even realize that you’re suffering from bruxism, since the condition affects you while you’re asleep. Most notably, bruxism will cause wear on your teeth. Your teeth may lose enamel mass over time, which is a problem for the health of those teeth individually, but it can also cause problems with your bite. As your bite changes, it can create pressure on the joints of your jaw, causing you pain. This can contribute to temporomandibular joint (TMJ) disorder. Inflammation of these joints can lead to headaches, popping sensations, and trouble moving your jaw. If you’re experiencing these symptoms with no clear explanation, the root cause may be bruxism. 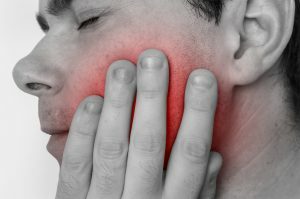 Your bruxism may be caused by an uneven bite, which is simply the product of how your jaw naturally rests. However, bruxism may also be caused by TMJ itself, which will need treatment. Bruxism can be caused by high levels of stress as well. You may not always understand the amount of stress that you’re carrying. It may not manifest itself during the day, but rather, while you’re sleeping. If high stress levels are the cause of your bruxism, you’ll need to find treatment for this stress, because it can also lead to problems like high blood pressure and heart disease. If stress levels are causing your bruxism, you’ll want to find treatment for that stress. Your dentist can help you treat the effects of bruxism easily enough with an oral appliance. This simple, mouthguard-like appliance is worn at night to push the jaw into alignment and prevent the wear and tear that comes with teeth grinding. If bruxism has already caused significant damage to your teeth, your dentist can provide restorative treatment to repair your smile and protect these damaged teeth in the future. If you’re suffering from symptoms like unexplained headaches and jaw pain, teeth grinding may be the cause. Ask the team at Cedar Dental about bruxism testing and treatment. You’ll feel much better after treating this harmful condition. Schedule an appointment for a dental visit at Cedar Dental in Cedar Rapids, IA by calling 319-364-7108.